Thank you for your interest in learning about becoming an adoptive parent with Adams County! If you have an approved adoptive home study and would like to learn more about kids that are available for adoption, please contact Rishell Hessing, Adams County HSD, Children and Family Services, at 720.523.4345, or view the Children’s Gallery to view profile information. There are children who have been abused or neglected waiting for a family to offer them a lifetime of unconditional love and support. Most of these children are over 8 years old or a part of a sibling group. Can you commit to being a forever family to one of our waiting children? We are seeking adoptive parents for children unable to return to their birth families due to safety concerns. When a parent/child relationship is severed through court action, a plan is developed to find a prospective adoptive family who can provide safety and permanency. 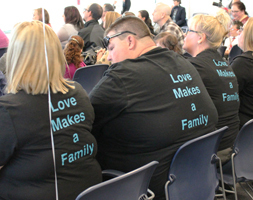 This goal is accomplished through recruiting and approving adoptive families, including relatives and foster parents. Adams County Human Services Department offers support throughout the process and after finalization. The adoption process entails an application, a background check, training, and a home study. Once a prospective adoptive family has been approved, their home study may be included in a matching staffing to select the best family for a particular child or sibling group. The family selected is then given child-specific information and has the opportunity to move towards adoption or decline. If the family expresses a commitment to adopt the child, they will attend a meeting to discuss possible adoption assistance. The family then meets the child to build a relationship and ultimately has the child transition into their family. The child’s adoption worker works with the child/youth and adoptive parents until the adoption has been finalized. Many times it is recommended that the family attend therapy with the child(ren) to build attachment, support all the family members and address new family dynamics. We are here to assist in making the most appropriate match between adoptive parents and the children waiting for permanent homes. After finalization adoptive families may be supported through a monthly support group, an e-newsletter, notifications of community resources and trainings, and Medicaid coverage. Click here to view a list of websites and suggested reading that can act as support for adoptive families. Many of the children who are legally freed for adoption and waiting for adoptive families are 8 years old and older or part of a sibling group. It is often harder for youth, 12 and older who wish to be adopted, to find permanency. Families interested in adopting teenagers are strongly encouraged to apply. If you are interested in learning more about the Adams County children who are legally freed for adoption and in need of adoptive families, please view the Children’s Gallery to view profile information. 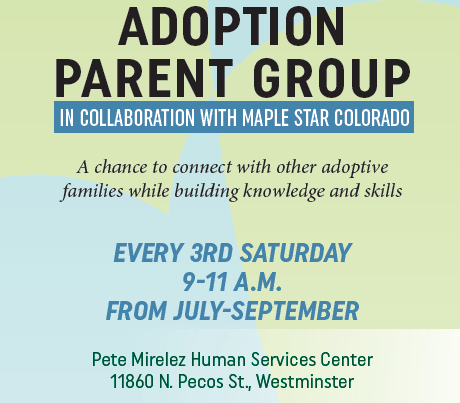 For questions about the adoption process, please call 720.523.4345.